The Manor of Powderham was mentioned in the Domesday Book. 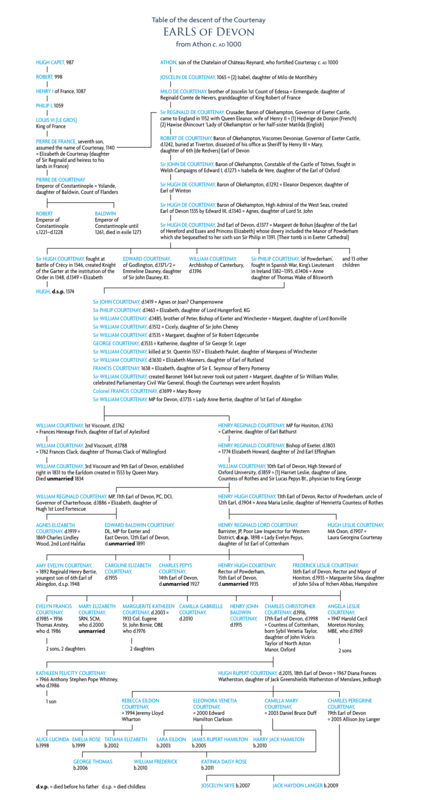 It came into the Courtenay family in the dowry of Margaret de Bohun on her marriage to Hugh de Courtenay, son of the first Courtenay Earl of Devon in 1325. The Courtenays had come from France in the reign of Henry II and had acquired considerable lands and power in the South West by judicious marriages to wealthy heiresses. They had castles at Okehampton, Plympton and Colcolme near Colyton. Margaret bore her lord eight sons and nine daughters, and from this marriage descends all the subsequent Courtenay Earls of Devon. She outlived him for a number of years, and left Powderham to her sixth son, Philip, in her Will. Sir Philip began building the Castle as we see it today in 1391. The building had the typical medieval long hall layout with six tall towers, only one of which remains today. His elder son Richard, who became Bishop of Norwich, and was Henry V's ambassador to France on his claiming the French throne, succeeded Sir Philip. He died at the siege of Harfleur 1415, and was succeeded by his nephew, another Sir Philip, who added the ‘Grange' accommodation for important visitors, the site of the current chapel. During the early 15th Century the senior branch of the Courtenay family were at feud with the family of Bonville for control of the West Country, but it appears that Sir Philip Courtenay of Powderham was friendly with Sir William Bonville of Shute (since his son William married Margaret Bonville) and this brought upon him the wrath of Thomas Courtenay, 5th Earl, who laid siege to Powderham Castle for seven weeks in 1455 but failed to gain possession. During the Wars of the Roses the senior branches of the Courtenay family adhered to the House of Lancaster - probably because the Bonvilles were on the other side - but there is evidence that Sir Philip Courtenay of Powderham was also on the side of the House of York. Thomas Courtenay, 6th Earl of Devon, was captured, attainted (i.e. his titles forfeited) and beheaded after the battle of Towton near York in 1461. His younger brother, Sir Henry of Topsham, regained some of the estates, but was debarred from inheriting the title due to the attainder, and was himself beheaded for treason in 1467; and the youngest brother, John, who was restored to the Earldom in 1470, was killed at the battle of Tewkesbury in 1471. This was the end of the senior line. The third Earl had had a younger brother, Sir Hugh of Haccombe, who by his third wife had a son Sir Hugh of Boconnock, who also died of wounds following the Battle of Tewkesbury. 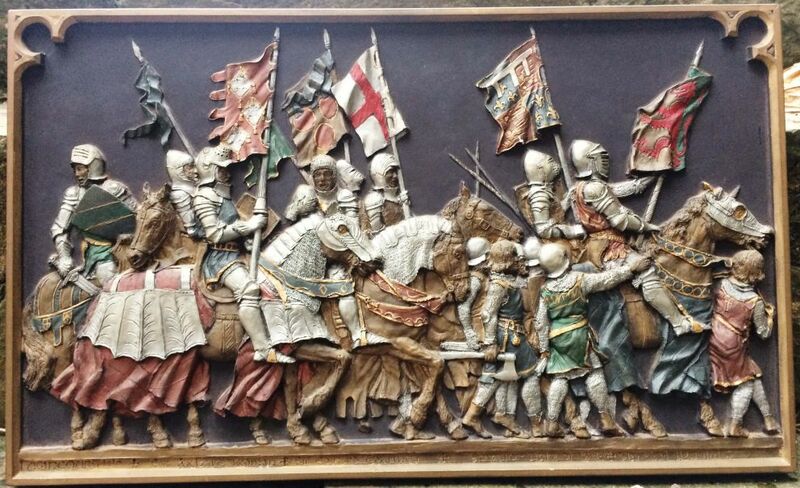 His son, Edward, together with his son, William, fought on the side of Henry Tudor at the Battle of Bosworth in 1485, and upon Henry's being crowned King Henry VII he recreated the Earldom of Devon (or Devonshire) in favour of Sir Edward Courtenay. King Henry married Elizabeth of York, the eldest daughter of Edward IV, and William Courtenay married her younger sister Katherine. This marriage brought upon him the jealousy of the King, and he was attainted in 1504 and imprisoned in the Tower of London. Upon the accession of Henry VIII in 1509 he was released, but his father dying that year, he was debarred from inheriting the Earldom due to his own attainder, which had not been reversed. King Henry VIII created him Earl of Devon in 1511, but he died before his investiture could be completed; nevertheless he was buried "with the honours of an Earl". Princess Katherine outlived him by a number of years, living at Tiverton Castle. They had a son, Henry, who succeeded as Earl of Devon and by his second wife had a son, Edward. King Henry named Henry Courtenay as his successor when he went to the Field of the Cloth of Gold, having as yet no heirs of his body, and created him Marquess of Exeter. Later they quarrelled and Henry Courtenay was accused of treasonable correspondence with his cousin Cardinal Pole, imprisoned in the Tower of London with his son, and attainted and beheaded in 1538. His son Edward, only 12 years old at the time, remained in the Tower until the accession of Queen Mary in 1553. He carried the Sword of State at her coronation in July, and was created by her Earl of Devon in September of that year, but appears to have been used as a pawn by the various factions of that time, and was again accused of treasonable correspondence, imprisoned again and finally exiled; he died in Padua, Italy in 1556 aged 30. Meanwhile at Powderham the succession had passed peacefully through several generations, and upon the death of Edward was held by Sir William Courtenay, the great-great-great-grandson of the second Sir Philip. Because of the wide remainder of the letters patent granting the Earldom to Edward Courtenay in 1553, the Courtenays of Powderham were entitled to inherit the title, but either this was not realised at the time, or else they decided it would be more prudent to lie low. Sir William was killed at the siege of St. Quintin in 1557, leaving a son aged only 4 years old. In the 1640's Exeter was the South of England's second city after Bristol, and therefore of strategic importance. Exeter, and Powderham Castle, suffered terrible losses and damage in the Civil War (1642-6) between Charles I and Parliament. Within the City loyalties were divided (although Queen Henrietta Maria gave birth to her youngest daughter, Henrietta, there before retreating to France), but Powderham Castle remained a Royalist outpost faithful to King Charles. The Roundhead (pro-Parliament) faction triumphed at first in Exeter, but the Royalists held on at Powderham Castle. The Roundheads repaired the City walls; gun batteries were set up and ditches deepened. Nevertheless the Royalist armies eventually recaptured the city in 1643 and held it until early in 1646. In 1645 there was a major Parliamentarian assault on Powderham from across the River Exe. This was unsuccessful; but the Roundheads withdrew, gathered reinforcements and made a successful assault in January 1646. A triumphant Parliamentary force led by Sir Thomas Fairfax finally recaptured Exeter in 1646 as the Royalists holding the City had lost public support, illness was rife and morale low, forcing them to surrender. For Exeter, and for Powderham, the three years of bitter conflict was over. There were no family members at the Castle during the siege, but a Royalist garrison. The head of the family, Sir William Courtenay, was fighting on the Royalist side at the Battle of Bridgewater in Somerset, where he received bullet wounds to both legs. Powderham had been fairly badly damaged during the two sieges, and although it was not completely abandoned the family did not live there again during Sir William's lifetime. He had married Margaret Waller, heiress of Forde House in Newton Abbot. Margaret was the daughter of Sir William Waller, a Parliamentary general, and his wife Jane Reynell. Margaret had been brought up by her grandmother, Lucy, Lady Reynell since her mother died very shortly after she was born. It is said that William and Margaret were married so young that "they could not make thirty between them at the birth of their first child". They had a large number of children! It appears that the family lived at Forde House until Sir William's death in 1702 when his grandson, another William, inherited Powderham and his other properties. Sir William Courtenay and his wife, Lady Anne Bertie, decided to restore Powderham Castle. They were probably responsible for transforming the long Great Hall into different areas, the Staircase Hall and the Marble Hall with two floors above it. Their son, Sir William, later the 1st Viscount Courtenay, inherited in 1735 and continued the improvements at Powderham. He was responsible for the wonderful rococo plasterwork on the hall and staircase walls, and it is his coat of arms over the doorway into the Marble Hall. He was one of the founding members of the Devon and Exeter Hospital in 1740. He was created Viscount Courtenay of Powderham in 1762 only ten days before his death. His son, the second Viscount continued with the improvements and additions at Powderham. He married Frances Clack in 1762 and had 14 children - 13 daughters and one son. He converted the chapel into a library and built another chapel near the northwest tower. He designed the Belvedere Tower in 1771. It was built using locally made bricks but timber from the New World. In 1788 his only son, another William, became the third Viscount Courtenay. He was responsible for the addition of the Music Room, designed by the famous architect James Wyatt, a design that included a carpet made in the newly formed Axminster Carpet Company. It was the biggest carpet they ever made, until the Prince Regent found out about it and insisted upon having a bigger one! The Third Viscount led a rather flamboyant lifestyle. He was a homosexual, and was forced to live abroad in consequence, first of all in the United States where he owned a property on the Hudson River in New York State, and later in Paris where he died in 1835. In 1831 he successfully applied to have the title of Earl of Devon, created in 1553, restored to the Courtenay family and became the 9th Earl. Despite having lived abroad for so long, he was dearly loved by his tenants who insisted that he be buried in stately fashion back at Powderham. In 1835 William Courtenay, son of the Bishop of Exeter who was himself the son of the younger brother of the First Viscount, inherited the title as the 10th Earl of Devon from his cousin the third Viscount Courtenay/9th Earl.of Devon. He lost no time in engaging the architect Charles Fowler to make Powderham "of a character consistent with an ancient castle". This he did very successfully, adding the State Dining Room, and at the same time changing the main entrance from the eastern side to the western, creating the viaduct and courtyard with the medieval style gatehouse. A raised garden was constructed on the eastern side facing the River Exe. The 10th Earl died in 1859 and the renovations which he had begun were completed by his son, William Reginald, 11th Earl, who put the linenfold panelling into the State Dining Room with the heraldic shields showing the descent of the French and English branches of the Courtenay family, and the families into which they married. During these renovations the chapel built by the 2nd Viscount was demolished, and in 1861 the medieval Grange was converted into a family chapel. The 11th Earl was a widower for more than twenty years before his death in 1888, when he was succeeded by his only surviving son, Baldwin, who, although he never married, is believed to have had several children. He died in 1891, and was succeeded by his uncle, Henry Hugh, who was Rector of Powderham, as the 13th Earl. The 13th Earl was eighty years old when he succeeded his nephew, and decided to continue to live in the Rectory (which he had built) and let the Castle to a family called Bradshaw. It was at this time that further alterations were made to the kitchens. In 1844 The South Devon Atmospheric Board Gauge Railway was constructed through Powderham Park on its way from Exeter to Dawlish. Isambard Kingdom Brunel, the famous Victorian designer, was the Chief Engineer and a business colleague of Lord Courtenay. Lord Courtenay, a member of the Atmospheric Railway Board, together with Isambard Kingdom Brunel had the foresight to select the flat estuary route through Devon for the railway, rather than the traditional route over the hills of Dartmoor. Brunel was also responsible for designing the road, which still runs from Powderham village to Starcross on the eastern side of Powderham deer park. The very first passengers were taken from Exeter to Dawlish on the Whit weekend of May 1846. In 1876 The South Devon Railway became part of The Great Western Railway and in 1892 the broad gauge line was changed to the standard gauge used today. Henry Hugh, 13th Earl, lived to be 92 and outlived his elder son by some six years. His eldest grandson, Charles Pepys Courtenay, 14th Earl, succeeded him in 1904. Powderham for the next thirty years was a bachelor household, as neither the 14th Earl, nor his younger brother Henry Hugh, who succeeded him as 15th Earl in 1927, ever married. The 15th Earl (who had been curate to his grandfather at Powderham and was Rector there until he succeeded to the Earldom) died in February 1935. His brother, the youngest of the three grandsons of the 13th Earl, succeeded to the Earldom, but only outlived his brother by four months, dying in June 1935 when he was succeeded by his only surviving son, Christopher, the 17th Earl, who was then aged 18. In July 1939 the 17th Earl, shortly after his 23rd birthday, married Venetia, Countess of Cottenham, the former wife of his second cousin. He also acquired two stepdaughters, Ladies Rose and Paulina Pepys. He was called up in September at the outbreak of the Second World War and served throughout in the Coldstream Guards, leaving his wife to run the Castle and the estate, which, however, had been much diminished by reason of the deaths of four Earls and the consequent death duties that had to be paid. His daughter Katherine was born in 1940 and his son, Hugh, in 1942. Between the two world wars agriculture, which provided the income for the estate, was in the doldrums and after the war several attempts were made to make Powderham and the estate pay. The Countess of Devon opened a domestic science school in the Castle, and a large house in Kenton called Court Hall was run for a while as a hotel. Neither of these ventures was successful in the long term. The 17th Earl took charge of the Home Farm (where the Country Store now is) and built up a herd of South Devon cattle. This was more successful, in that the cattle won many prizes, but ultimately it did not pay and the herd was dispersed. The 17th Earl died in 1998, aged 82 and having been Earl of Devon for sixty-three years. 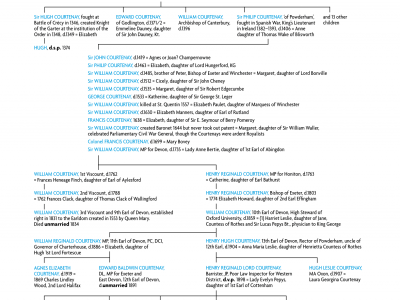 He was succeeded by his only son, Hugh Courtenay, who had been managing the estate for some years beforehand and whose wife, Diana, gave birth to three daughters, Rebecca (Beebs), Eleonora (Nell) and Camilla (Billa), and a son, Charles (Charlie). The family lived happily at the Castle during the 1990s and did much work to update the private side to become a modern(ish) home. All four children got married and provided Hugh and Diana with eleven grandchildren – Alice, Mimi, Tati, Lara, James, Harry, George, Willy-Billy, Tinka, Joscelyn and Jack. Very sadly, Hugh Courtenay died in August 2015 after only 17 years as Earl of Devon – a massive loss to the family, the Powderham community and Devon. He was succeeded by his son, Charlie. Charlie is a lawyer, who married Allison Joy (‘AJ’) Langer in 2004. Charlie and AJ have two children, Joscelyn and Jack. They recently moved into Powderham, the 28th generation of the family to enjoy living in this remarkable family home.